Marcie Mersky, director of Program Office at ICTJ, provided reflections on the experiences of transitional justice, particularly truth seeking, in the Latin American contexts. Latin America authors more than 30 years of experience in the struggle for accountability and implementing all mechanisms of transitional justice. Mersky's discussion focused on truth seeking, highlighting the falsity of the dilemma between truth and justice, between traditional and transitional justice. The key lesson she imparted was that social, political and institutional process do not happen quickly. The implementation of transitional justice mechanisms in Latin American countries continued far beyond the political transition. And while this is not ideal, while the victims waited too long for truth and justice, the mechanisms implemented must be credible, legitimate, and fair in eyes of victims and society as a whole. And this can take time to achieve, and must be emphasized over expediency. Through examples from Guatemala, Argentina, Colombia, and other countries in Latin America, she demonstrated how truth-seeking measures emerged to combat the state denial about what happened and establish a narrative on the past. They initially gained prominence due to official amnesties and the continued presence of the military as a political force, which made prosecutions impossible. "Issues of human rights violations, corruption, and other abuses of authority don't disappear by decree, amnesty, or official neglect," she asserted. "These violations tore the very fabric of society; transitional justice seeks to heal this, often beginning with truth-seeking." Truth-seeking measures pave the way for prosecutions, however. The work of almost all current prosecutions in the region have built on the work and findings of truth commissions, especially in regards to investigating and prosecuting disappearances. She concluded by highlighting the importance of the role of civil society in demanding and supporting truth-seeking efforts. There must be a place at the table for civil society at the creation of a truth commission, she stated. This will ensure a more successful mechanism, attuned to the rights and needs of victims, and greater legitimacy, especially in light of new governments struggling to prove themselves after a revolution. Nick Koumjian, a lawyer specializing in international criminal justice, continued the discussion, focusing on the strengths and limitations of criminal prosecutions to address mass violations in a transitional period. "When we talk about a "just society," what does that mean?" he asked to begin the discussion. He proceeded by contending the answer is a society where everyone has equal rights, equal responsibilities, and everyone is accountable for their actions. Criminal law plays key role in achieving this. He shared his experience working on the trial of Charles Taylor, former president of Liberia, and the notion that in a fair trial, dignity is given to both the victim testifying and the perpetrator. All are equal before the law; criminal prosecutions strip violators of their power of impunity, and puts them on equal grounds with their victims and those who give testimony. While emphasizing the strengths of the prosecutions process, he acknowledged the importance of using other transitional justice mechanisms to complement the work of trials. Criminal trials are fundamentally limited in reach; not all violators can be prosecuted, not all victims can provide testimony. Truth commissions, for example, can bridge this gap. He concluded with a clear warning on the potential for prosecutions to be misused. Prosecutions cannot be used for political change, he asserted. People cannot be prosecuted simply for what political party they belonged to; actions, not affiliations must be brought to account in court. 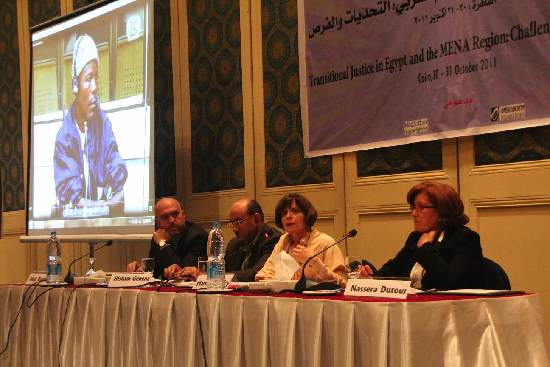 Nassera Dutour, head of the Association of Families of the Disappeared in Algeria concluded the session. Building on prior discussion of enforced disappearances, she shared a personal account of a mother's suffering; her son was disappeared by Algerian intelligence. "My message to all victims is 'don't lose hope'," she said. "It takes years." She elaborated on the work of the Association of Families of the Disappeared, which works across Algeria collecting accounts of disappeared persons and lobbying the government to provide information on the whereabouts for their family members. But efforts to pursue truth and accountability remain incredibly difficult in Algeria. A seminar on transitional justice was banned earlier this year. Fear of reprisal keeps many victims, and families of victims silent. "What must happen to take us to this transition period?" she asked in conclusion. "We need a democracy. We need to prosecute those responsible. The families of the disappeared deserve the truth." The next session, with presentations by ICTJ's Ruben Carranza and Kelli Muddell, and Yasmin Sooka, former commissioner at the Truth and Reconciliation Commission in South Africa, addressed redressing past violations and incorporating a gender perspective in transitional justice measures.